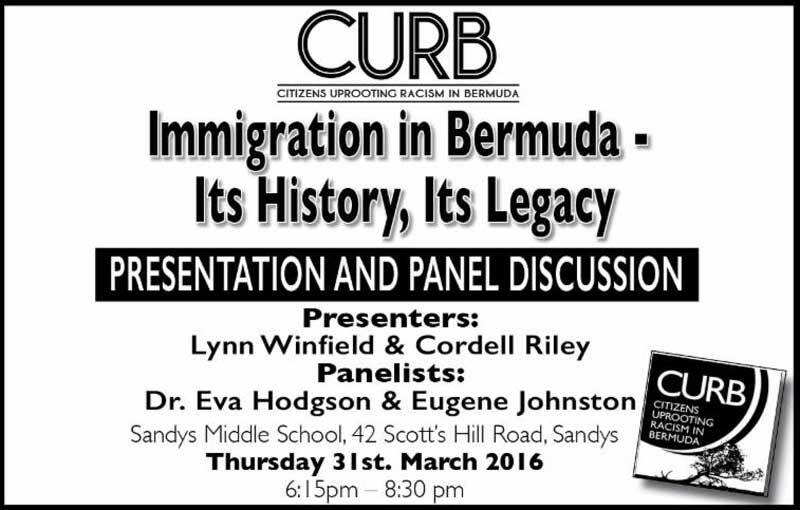 Citizens Uprooting Racism in Bermuda [CURB] is set to host a presentation and panel discussion on “Immigration in Bermuda, its history, its legacy” on Thursday, 31st March from 6:15pm to 8:30pm at Sandys Middle School. Maybe 25 or so people with handwritten signs should go along and disrupt it. That’s the Bermudian way of doing things, isn’t it? I challenge all to Go to this lecture and learn the history and then decide. Empathy and Understanding is sadly lacking on both sides of this issue. Hopefully we can find a common ground. Could we also challenge ourselves to see things through other people’s lenses? Empathy: the ability to sense other people’s emotions, coupled with the ability to imagine what someone else might be thinking or feeling. In other word who feels it know it. Understanding: sympathetically aware of other people’s feelings; tolerant and forgiving.the ability to understand something; comprehension.having insight or good judgment. It is a lecture so listen and agree. If you disagree with any of this group of panelists, you will have your physiological state analyzed on the spot with race/racism or both being the motivator for your theoretical disagreement. I am staying home to play with my kids instead.